WBSEDCL Assistant Manager Admit Card 2018-2019: Candidates who are going to appear for the WBSEDCL written examination for Assistant Manager, Junior Executive posts, they should download the WBSEDCL Admit Card from this page. The West Bengal State Electricity Distribution Company Limited officials will disclose the WBSEDCL Assistant Manager, Jr. Executive Hall Ticket 2018-2019 through online mode at www.wbsedcl.in. Aspirants have to download it by entering the login credential information. The WBSEDCL Asst Manager Call Letter 2018-2019 is a compulsory document for the written examination. So all the applicants must download the WBSEDCL Assistant Manager Admit Card 2018-2019 from the official website and carry it for the examination center. Name of the Positions Assistant Manager (HR & A), Asst Manager (F&A) and Junior Executive (Finance). WBSEDCL Assistant Manager Admit Card 2018-2019 will be avaliable soon to download. The West Bengal State Electricity Distribution Company Limited officials had released a recruitment notification for 81 Assistant Manager (HR & A), Asst Manager (F&A) and Junior Executive (Finance) posts. For this recruitment, the application process started on 3rd November 2018, and the application process end date on 26th November 2018. A huge number of applications received by the authorities from the job seekers. Therefore is a tight competition for these vacancies. To select the skillful and talented candidates, the officials decided to conduct the Written Exam and Interview. The WBSEDCL Assistant Manager Admit Card 2018-2019 contains the following information. Candidates have to carry WBSEDCL Assistant Manager Admit Card and any one of the ID Proof from the below-given list for the written examination. 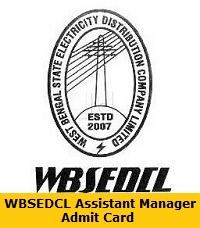 The West Bengal State Electricity Distribution Company Limited (WBSEDCL) is planning to conduct the WBSEDCL Assistant Manager, Jr. Executive Examination in upcoming days. The higher officials didn’t declare any particular date related to the examination. Once the examination date is out, then we will update you via thsi article. Candidates can also move up with the official website to know more details about the WBSEDCL Assistant Manager, Jr. Executive Examination. Candidates first open the official website at WBSEDCL at www.wbsedcl.in. West Bengal State Electricity Distribution Company Limited main page will be open on the screen. Find the WBSEDCL Assistant Manager Admit Card link in what’s new section. After that cross check all given information and submit them. Now WBSEDCL Assistant Manager Admit Card will display. Hope the above provided information about WBSEDCL Assistant Manager Admit Card 2018-2019 is good enough for all the applicants. Most of the candidates deeply seraching for WBSEDCL Assistant Manager, Jr. Executive Hall Ticket at various websites. So aspirants can share this article with your friends too. For more upcoming updates keep following Sarkari Recruitment on a daily basis. Thank you. As of now, the details of WBSEDCL Assistant Manager Admit Card 2018-2019 has not been announced. The information provided here about WBSEDCL Assistant Manager, Jr. Executive Hall Ticket is just for reference purpose only. We will update this page with the latest information once the Admit Card Release Date is Out.